In our last post, we reported on Shawn Hill clawing his way back to the Majors with the Toronto Blue Jays, where he last appeared in the bigs in 2010. This afternoon, he was thrust into Toronto’s game at Rogers Centre against the Yankees, after starter Ricky Romero was injured in the third inning. Hill pitched the fourth, fifth and sixth, and didn’t allow a run in the three-inning appearance. The Blue Jays defeated Andy Pettitte and the Yankees 3-2. With the victory, Hill became the first player ever to earn a winning decision in a Major League game after playing for the Revolution. The Mets’ Justin Hampson (York ’10) is 0-0 with a 2.08 ERA this season in 11 MLB appearances and 8.2 innings pitched as a lefty match-up guy out of the bullpen, and is holding opponents to a .214 average. But it’s Hill who gets the honor of first Revolution alum to earn a big league win. 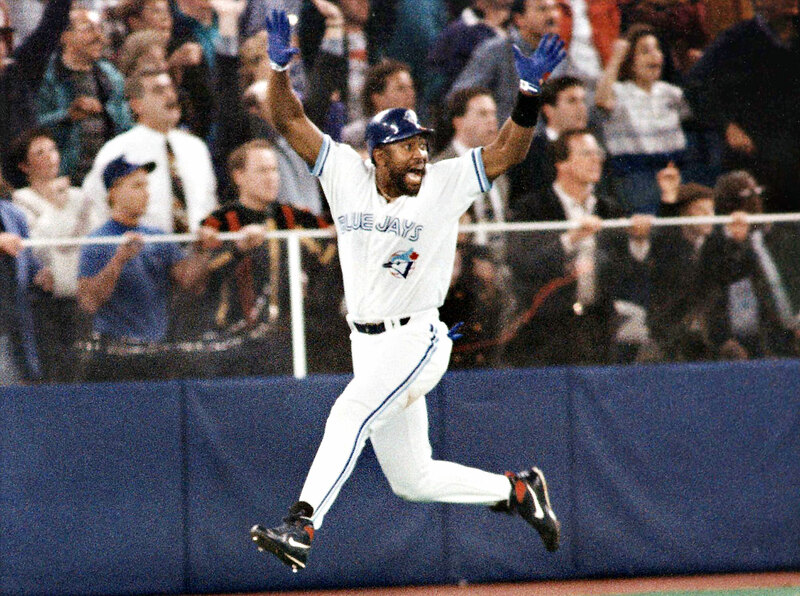 It wasn’t quite Joe Carter’s home run in Game 6 of the World Series today in the building formerly known as SkyDome, but a great milestone for a former Rev. For the third time in franchise history, and the second time this season, an alum of the York Revolution has reached the Major Leagues. Right-handed starting pitcher Shawn Hill, who set a record for the most consecutive scoreless innings in Revolution history earlier this season, has been promoted to the Toronto Blue Jays. Hill’s contract was purchased from York on June 18 by Toronto. Hill’s time in York was relatively brief, but the right-hander made a tremendous impact. Once Hill became a regular in the Revolution starting rotation, he did not allow a run in the final 27 and two-thirds innings he pitched in a York uniform, over his final five starts for the club. Hill then went 9-2 in 15 starts for Triple-A Las Vegas. He will wear number 45 for the Blue Jays. 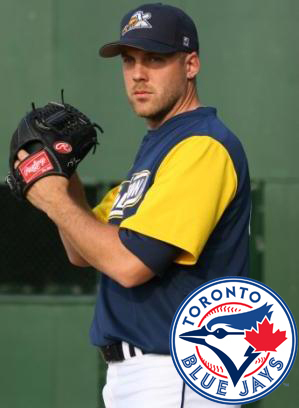 This will be the second time the Mississauga, Ontario native will play for his home-Provence team in the Major Leagues. The Blue Jays had been the most recent team Hill pitched for, before arm injuries cost him all of the 2011 season. In Hill’s most recent Major League time he was quite impressive for the Blue Jays in 2010, tossing 20 and two-thirds innings in four starts posting a 2.61 ERA. Hill is a veteran of 44 MLB games (all starts) between 2004 and 2010 with the Montreal/Washington organization, San Diego and Toronto. Hill has also been a significant part of the Canadian National Team, in both Olympic and Pan-Am Games play. He’s one of just four native Canadians to play for both the Montreal Expos and Toronto Blue Jays in the Majors, and is now in his 11th professional season. This coming spring, Hill will pitch once again for Team Canada in the World Baseball Classic. In five of the last six years, at least one player has begun the season in the Atlantic League, and finished the season in the Majors. This year that is true of two players; Hill and former Long Island Ducks outfielder Lew Ford who is now with the Baltimore Orioles. For the York Revolution, it’s the second time the organization has sent a player from its club to the Majors in the same season. The first Rev to reach the big leagues, outfielder Tike Redman, began the inaugural 2007 season in York before ending it with the Orioles. 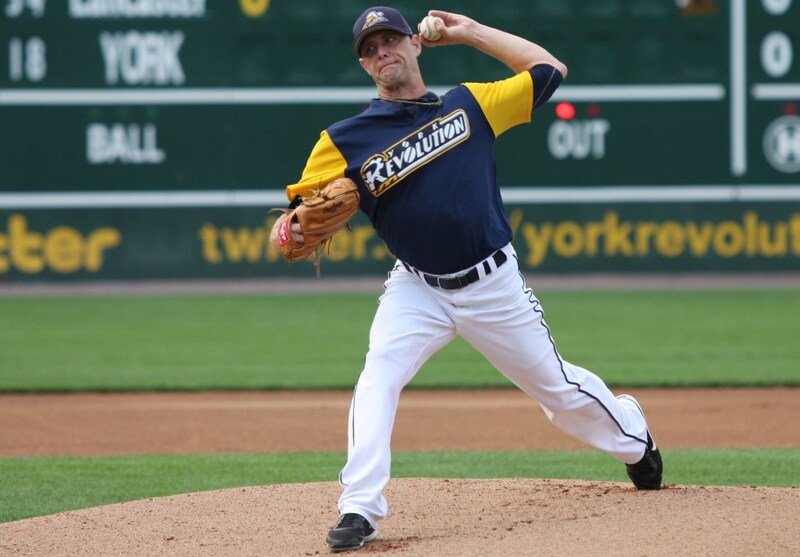 Left-handed relief pitcher Justin Hampson, who played in York in 2010, is currently with the New York Mets. Paired with Hampson, Hill’s promotion marks the first time two Revolution alums have been active in the Major Leagues at the same time. Right now, it appears both Andy Etchebarren and Butch Hobson plan to bring their Game 1 starters back on short rest for a potential Game 5 on Sunday. Should that decisive game take place, it will be at 1 p.m. Worried about football? Well consider this – the Ravens play this Thursday, the Eagles don’t play until 8:20 on Sunday night, and the Steelers have a bye week. If anyone wants updates on the Patriots vs. Bills, just visit me in the press box. Click here to buy playoff tickets. Ballpark Digest’s comprehensive list of Minor League Baseball attendance is out now that all regular seasons are over. The list includes every professional minor league team in North America, and wood bat summer collegiate leagues. Those are amateur leagues involving active college players. Of those 388 teams, the York Revolution finished 80th overall based on per-game average, drawing 4,084 fans a game to Sovereign Bank Stadium this year, a 5% increase from the 3,904 fans per game drawn during the 2011 regular season. You can check out the whole list for yourself at the link above, below and after the jump are some highlights and teams of interest. Here’s the Revolution’s official press release on a pep rally happening at the AAA location in East York on Wednesday. All the fans will then invade route 30 en-route to Game 1 of the series with a Revolution convoy. See you there! The York Revolution and corporate partner AAA have announced plans for a pre-playoff pep rally and convoy before the Revolution travel to Lancaster for Game 1 of the best-of-five Freedom Division Championship series. The Revolution will take on the Lancaster Barnstormers in Game 1 on Wednesday at 7:05 p.m. at Clipper Magazine Stadium in Lancaster. Prior to the game, Revolution fans are encouraged to meet up at the AAA Southern Pennsylvania location on Eastern Boulevard in York. At the rally, fans may pick up a 2012 Playoffs rally towel presented by AAA. The same rally towel will be handed out to the first 2,000 fans at Game 3 of the series Friday evening at Sovereign Bank Stadium in York. This is a chance for Revolution fans to get their hands on one early to cheer their team on! Fans at the rally at AAA on Wednesday may also get their picture taken with DownTown, pick up a pair of Revolution cheerstix to try and drown out the cowbells from Lancaster and grab a snack before all the Revolution fans convoy over to Lancaster for the game. The Revolution is attempting to be the first team in Atlantic League history to win three consecutive championships. The most recent was the Somerset Patriots in 2008 and 2009. Last season, York outlasted Lancaster in a thrilling playoff series that went the full five games. Like last season, Lancaster won the Freedom Division first half title, and York took the second half once again to set up the rematch. Home Runs: Chris Nowak finished with 34, destroying his own previous record of 25 a season ago, which eclipsed Jason Aspito’s 24 in 2008. The 30-home run plateau isn’t broken in the Atlantic League often, so this mark might stand for a while – unless Nowak returns to York next year. It’s the first 30-home run season in the Atlantic League since Jesse Hoorelbeke hit 33 for Bridgeport in 2007. Andres Perez’s 23 homers this season was the fourth-best all-time by a Rev. Nowak’s career Revolution total of 59 home runs now gives him a 17-homer lead over Aspito in that department. RBI: Chris Nowak finished with 107, two better than Jason Aspito’s 105 in 2008. Andres Perez’s 86 RBI is tied for the fifth-best single season in Revs history. Nate Espy had 90 in 2007, Jose Herrera had 87 in 2010, and James Shanks and Ian Bladergroen had 86 in 2010. Extra Base Hits: Andres Perez set a new record this season, with 61. 23 home runs, three triples and 35 doubles. He surpassed Jason Aspito’s record of 59 in 2008. Wins: Corey Thurman went 14-3 this season, one win better than the 13-3 mark he put up in 2011. His 52 career wins in a Revolution uniform give him a 32-win lead over Wayne Franklin, who has 20. Thurman, who is third all-time in Atlantic League history, is within striking distance of second-place Lincoln Mikkelsen who has 62 wins. He’s 22 wins behind all-time league leader Tim Cain. Thurman would need two more full seasons on-par or just a little worse than his last two to catch Cain. Still a long way to go but certainly do-able. Earned Run Average: Well, here’s one Revolution pitching record that Corey Thurman no longer owns. Ryan Feierabend shattered Thurman’s single-season ERA mark this season, finishing at 2.71 in 18 starts and 113 innings pitched. (9-5 record). The minimum innings pitched for the record is 101. Thurman’s record in the hitter-friendly Atlantic League was 3.33 last season. Feierabend began the season in York, then was picked up by the Cincinnati Reds and made seven starts for their Triple-A club in Louisville before returning to York. He passed the 101 innings threshold with a start to spare in order to qualify for the record. Each day it’s a new milestone for the York Revolution, and Monday night deep in the heart of Texas, they found a couple more. The Revs second consecutive shutout, a 6-0 win over Sugar Land, was also the 400th victory in franchise history. The win was thanks to Chris Waters, who was one batter away from being perfect in the ballgame. The only base runner he allowed was Aaron Bates, who reached on a two-out double in the fifth, as Waters retired 27 of the 28 he faced with six strikeouts. The complete-game one-hitter is the first in Revolution history. In six seasons, the franchise does not have a no-hitter to it’s credit yet, making Monday night at Sugar Land easily the most dominating single-game pitching performance in franchise history. Waters needed just 85 pitches, 60 of which went for strikes. The Revolution have now won six in a row, and are 14-4 in September. With the playoffs now just five games away, Revs fans are understandably excited about the looming rematch with Lancaster the way Ryan Feierabend, Corey Thurman and Waters are throwing the ball right now.